I picked up a 2001 Sport Nautique a couple of weeks ago. I am planning to fix it up and sell it in the spring. This one has been fun to work on already! The photo, sans-windshield, makes me think of late mid to late '90s Baja boats. They had little plastic panels to deflect the wind when you were at speed. My friend had 24' Baja with a 454. It would do 70 - 75 mph. It took forever to get to that speed with that size prop. I used to race him in my little 1979 Ski Nautique when we were at the large lake. He would catch up and pass me by the second mile marker! 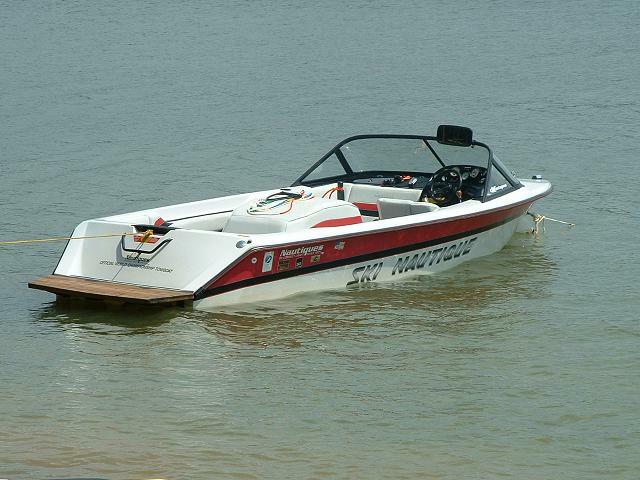 Enjoy working on your 'Baja-Nautique'. Glad everything lined up right for your trip. That looks like a fun project. Enjoy. Where did you find it down here out of curiosity? Looks like a great project Jeff! Picked up the windshield today. Found a used one for way less than what Nautique wants for a new one, so I am pretty pumped about that. I am going to take it apart tomorrow and have the frame powder coated, so it'll look brand new. Since I am going to do that, I might as well pull the other painted parts off and have them done as well (vent covers, rub rail end cover, etc). Also decided to pull the stereo head unit out completely. I'll do a hidden Roswell Cybox, directly connected to the amp, that will allow for direct bluetooth connectivity. I did this in my 1998 Ski Nautique, and it worked beautifully, and eliminates the head unit as a point of future failure (and obsolescence). The accessory switch on the dash will power the Roswell Cybox. I love this setup, and it really works well. Had some help taking apart the used windshield for this boat today. Frame is heading to Race City Powder Coating next week, along with the vent covers and rub rail ends. Got the SeaDek templating all wrapped up today. Hope SeaDek can make sense of my scribbles! Went with the regular Mocha over Black colors in the Teak pattern. That should look good with the brown carpet. Well, the windshield frame and vent covers are at the powder coat place, and the SeaDek templates have been sent out. Got a shipment from NautiqueParts today -- steering cable, passenger seat gas shock, new decals and pinstripe, and new windshield mounting trim. Also received the new battery cables from genuinedealz. These are great cables, and I have used them in my last few restorations. The original cables are 2 AWG. I always upgrade to 1 AWG (I'd like to do 0 AWG, but they won't fit through the opening in the floor!). Why do you go with 1AWG instead of 2? For the length of the run, it really should be 0. The Sport Nautique has the battery way up in the nose of the bow. Nautique undersized the cables from the factory. Not sure why. 1 is the largest that will easily fit through the floor openings. I’m excited to see how your dash turns out with the SeaDek. I’ve got the same color and pattern on my 01 SAN so your dash should resemble what mine would look like. May have that done next winter when I do the floor! Removed most of the decals from the boat today in order to get it ready for a full wet sand and buff. The sides look really good, but the back of the boat is a little faded. I decided to go all the way with a full wet sand and buff and new decals, so that the boat will have even color and can look as good as possible when it is done. I will be outsourcing the wet sand and buff because there is limited room in my shop right now, and I don't want to make a mess in the little room that I have. I'm also repairing a few small chips in the gelcoat. Nothing major. Just the results of use over the last eighteen years. Ran the new battery cables (note to anyone else doing this in a Sport Nautique -- order 15 foot cables!). Cleaned up the connections at the starter. Changed the oil and filter. Removed the back seat (what a pain). It has clearly never been out of the boat based on the trash back there. It'll get a good cleaning over the next couple of days. Engine should be ready for a compression test tonight, and maybe a test run tomorrow. I don't expect any issues, but I like to have the compression test numbers for any potential buyers. It goes to the gelcoat shop on Wednesday, so I am trying to get the mechanical stuff all tested and straightened out before that.